Montana Average Annual Precipitation, 1981-2010. I love driving from Missoula to Helena or Great Falls or Bozeman, over the big passes of the Continental Divide and along some of our country’s most spectacular rivers. On the west side of the Divide, we pass green foothills, huge ponderosas and larch, and soaring bald eagles and osprey. Dropping down onto the east side, we start to see grasslands, sage brush, mule deer and pronghorn. Travelers in Montana know that the climate on the east side of the Continental Divide is suddenly and significantly different than on the west side. Wondering why is a good thing to ponder on a long drive. 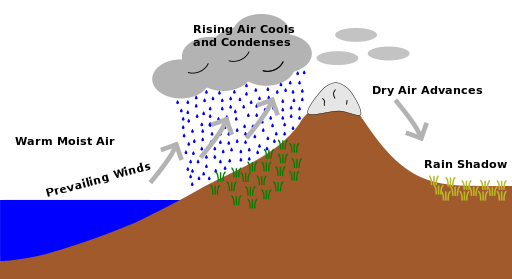 Diagram of the rain shadow effect. The average yearly precipitation in Helena is 11 inches — just shy of desert. Kalispell gets about 15 inches of precipitation a year, and Missoula gets about 14 inches. As that warm, ocean air moves west and up, snow and rain hydrates western Montana. On a walk in the woods, you’ll find ferns and cedar trees, mushrooms and huckleberries. But if you take a hike on the other side of the divide, you’ll see organisms adapted to survive in dry climates: prickly pear, sage brush, limber pine, rattlesnakes. Many species, like bears, elk, deer, cottonwood trees, ponderosa pine, knapweed, and people, can thrive on both sides of the divide.